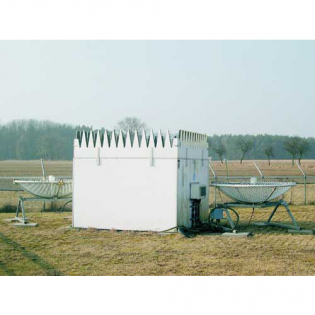 A Doppler SODAR (Sonic Detection And Ranging) system is a ground based remote sensing system for the measurement of vertical profiles of the horizontal wind vector and turbulence in the lower parts of the atmosphere. There are two SODAR systems available and the main difference between each model is the number of acoustic antenna and thus the measurement height. ** these heights are only possible in very favourable conditions – please the downloads section for more information. 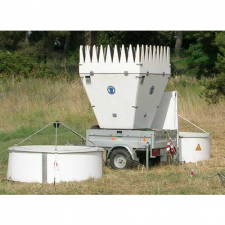 A SODAR is a mobile acoustic wind and turbulence profiler which gives a continuous near real-time three-dimensional vertical profile of the overhead wind structure. Temperature profiles can also be included using the optional RASS extension. SODARs are able to measure remotely by transmission of an acoustic signal into the atmosphere. As the signal is returned wind speed and direction information is derived using the Doppler shift. SODARs do not require any planning permission, structural masts or permanent fixings and can be transported conveniently in a standard van or trailer which simplifies the installation at remote sites. The system installation will take one trained operator less than one hour. RASS: SODAR can be enhanced with a Radio Acoustic Sounding System to provide a vertical temperature profile. See the RASS product page for more details. SODARs are able to measure up to 300 m in bad atmospheric conditions to over 1000 m in very good conditions (or up to 1500 m in favourable conditions for the longer range SODAR model PCS2000-64). Please refer to maximum measurement height in the comprehensive information packs available under the download tab. The resolution of the measurement can be varied to your needs (and depending on the model) from as little as every 10 m from a starting point of 15 m above the ground. The data is available in raw format, spectra or cluster analysis averaged data and plotted using graphical user software that is provided which gives a three dimensional plot of the wind speed and direction vectors amongst other information. SODARs require little or no maintenance if properly installed, and with the exception of possibly needing to change a loudspeaker or two every few years, there is no servicing or calibration needed (a spare loudspeaker is even provided with the original delivery just in case). wind farm siting research (they can show the all-important effects that turbulence structures will have on the blades of turbines, as well as aiding in establishing the power curve output for different sites). atmospheric research – a SODAR allows the user a better understanding of the boundary layer and any local effects of wind on meteorology. airport site evaluation (including wing tip vortex studies, low level wind shear or other turbulent structure monitoring along the glide path or elsewhere on the airfield). plume modelling, flow dispersion, inversion levels or pollution monitoring are easily done with the graphic interface and imaging of the data from the SODAR. ballistic meteorology such as artillery. This is far more cost effective than traditional radio-sonde flight releases during events and also allows a degree of independence as no consumables are required for continued operation.